12/9/2016 – UPDATE: After receiving a surge in traffic based on Rivian Automotive’s announced plans to buy a manufacturing plant and bring 500-1000 jobs to Central Illinois, I am posting all files relevant to the incentive contract that Rivian’s founders received when they were in Florida. Those files are at the bottom of this post. Rivian has morphed several times over the past seven years, promising much but delivering little. Here’s hoping they deliver on their end of the bargain for the people of Illinois, my birth state (Moline). And while many of Mayfield’s colleagues in the Florida House of Representatives – including Ritch Workman, her Republican primary opponent for Senate District 17 – also cast votes in favor of the $2 million grant, Mayfield’s ties to the mysterious company run much deeper. Two of the company’s three directors are named Robert Scaringe. One is now Mayfield’s husband, the other, her stepson. Sources confirm Mayfield and Scaringe had only started dating around the time she cast her vote, and so Mayfield would have been under no obligation to recuse herself from voting, nor would she be required to file a conflict of interest under the rules of the Florida House. They weren’t married until several years later. But her close ties to the company, and obvious financial benefits she may have received from Florida’s taxpayers, raise legitimate questions about how those tax dollars were spent, including the amount of those funds her boyfriend-turned-husband received in salary and benefits. A report filed in late 2011 only listed total salaries paid (see box, left), and did not break them down by individual. The company, Avera Motors, would later change its name – twice – ultimately becoming Rivian Automotive. In 2015, out of taxpayer funds and no closer to revealing a functioning automobile, the company abandoned Florida and moved to Michigan where it also received economic incentives to produce a wonder-car. Rivian plans to begin commercial sale of its coupe model in late 2013, with additional models following in 2014. The company has approximately 30 employees as well as 20 contract personnel contributing to vehicle development and expects to create 1,200 new jobs by 2015. Those jobs never materialized. Neither did the car. And now, even the company is gone from Florida. Image taken from Rivian Automotive website. And within weeks of the company’s move to Dearborn, Michigan last year, Mayfield loaned her Senate campaign $200,000, then in May and again in June of this year, took two additional personal loans from her family’s account for $100,000 each. While it’s impossible to tell exactly where Mayfield’s loans came from – prior to her eight-year career in politics, she worked as a banker and later owned her own mortgage company – the $2 million taxpayer grant to her husband’s company has become fair game as voters decide if she’s worthy of serving even longer in the Florida Senate. Mayfield’s campaign declined to comment for this story. But Erin Isaac, speaking on behalf of a political organization supporting Mayfield, pointed out that Ritch Workman, Mayfield’s primary opponent, cast a vote for the same grant, and the funds were then used by the governor for the grant project five years before Mayfield married Scaringe. “That’s the disgusting hybrid of hypocrisy and misogyny we’ve come to expect from Ritch Workman and is exactly why he’s getting destroyed in the polls,” Isaac said. If that’s true, Representative Debbie Mayfield should have no problem answering questions and providing voters with an accounting of how her family’s company burned through $2 million in tax funding, then moved the company out-of-state, leaving Florida taxpayers holding the bag. Florida budget line item granting $2 million to Avera Motors (PDF) – This document shows that Florida legislators voted to appropriate $2 million in exchange for an ultra-efficient car to be designed and built in Florida. Few in Florida ever saw a car, and clearly, it isn’t being built in Florida. But maybe Florida’s loss is Illinois’ gain. Name Change from Avera to Rivian (PDF) – This document shows that Avera Motors later changed its name to Rivian Automotive. Final report showing $1.1 million of grant paid in salary, no car delivered (PDF) – This document is the final report issued by an agency within the Florida state government stating that the terms of the grant were met by Rivian Automotive, even though the document also says that the terms were changed (by whose authority, it is unclear) at some point after state lawmakers voted on the appropriation. In short, maybe Rivian Automotive really has a top-secret wonder-car. But so far, they bilked Florida out of 2 million bucks, failed to deliver what they promised here, moved to Michigan, promised to build something there in November 2015, and so far, there is no further news of Rivian delivering on those promises, either. Their website contains no information about what they have accomplished in the seven years since they first got a $2 million check from Florida, and now they have announced plans to buy a big plant in Central Illinois. Maybe this time they’ll actually deliver. Good luck, my fellow Illini. Y’all deserve a break. Don’t forget to click on my sponsors! Merry Christmas to all. Follow @TheCapitolist on Twitter, like us on Facebook. Don’t have our mobile app yet? Get it FREE. Poorly researched article. Avera (now Rivian) produced a prototype in 2010, as cited by the Orlando Sentinel. They fulfilled the terms of the grant, and made a business decision to move to Michigan. Since the move, they’ve expanded from 17 employees to approximately 100 employees (92 of whom are on LinkedIn) and have invested some tens of millions in the Dearborn R&D facility. The Michigan Strategic Fund grant of 1.77M is dependent upon investment in the R&D facility and employment metrics. See page 55 below for details. The article speaks for itself. The Orlando Sentinel link proves nothing, except that Rivian drove a car around in a warehouse in front of some people. I could do that by renting a car and a warehouse and inviting people to the event. Rivian Automotive took $2 million from Florida taxpayers, which was allocated for the company to design and BUILD cars in Florida, and after cashing the check, the company up and left the state. Taxpayers were sold a bill of goods and left holding the bag. The company has repeatedly missed targets, pushed back deadlines, and scaled back promises. By all accounts, it has failed to meet any of the expectations that the Scaringe family set for it back in 2009. What do you expect of a prototype? 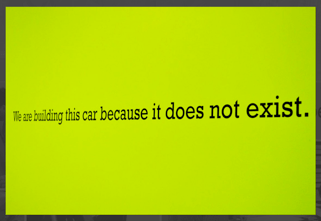 The assertion that a car never materialized is false, period. Your statements insinuate that Rivian was obligated to manufacture cars for market to fulfill the terms of the grant. That is false. Re-read the terms of the grant. This grant was explicitly provided for development, testing of a prototype vehicle. Rivian Motors promised to design and build cars IN Florida. That’s not happening. And your prototype has never been seen by the public, which paid $2 million for Rivian to design it. No prototype delivered to the public which funded the design. And, no cars being built in Florida. What, EXACTLY, did the Florida taxpayers get for their two million bucks? Do tell. I’m sure Rivian would have loved to manufacture vehicles in Brevard County as per their namesake and original intention, but good business decisions will be prioritized over such desires. Scaringe mentioned in the Normal Town Hall meeting that production costs per vehicle would have been thousands higher in Florida, which is a factor that could make or break the company. Why should they assume that risk if they have no legal or contractual obligation? I can understand if you’re upset that they left the state; such news is disappointing for all Floridians. What I take issue with is the tenuous corruption narrative you’ve created (in spite of bipartisan approval of the grant) and the allegation that Rivian is shady for engaging in little more than routine business. Your article has skewed the opinion of hundreds within the central Illinois community. What did Floridians get for their tax dollars? Well, the company operated in Florida for 6 years and provided gainful, high-paying jobs some 30 employees and dozens of contractors while they developed and tested their prototype vehicle. If that wasn’t enough, I might suggest you direct your criticism to those public officials that negotiated and approved the grant. Second, I expect a little more transparency and commitment out of a company that literally got two millions dollars for doing next to nothing. The company missed more than half of the targets, the money was granted in the first place because lawmakers were led to believe Rivian was going to design and build cars on the Space Coast – this was at a time when NASA was laying people off, so Rivian was given the grant on the basis that the company would remain in Florida. The state legislature is not in the business of incubating startups that are going to leave the state. Finally, I wish the company nothing but the best in Illinois and said as much on local radio there. I have no reason to believe Rivian’s intentions in Illinois aren’t to build cars and employ as many people as possible. That said, if you want me to do a follow up story that exonerates the company, then by all means, send me information about the 30 employees you paid over the six year time span you cite. As a central Illinoisan, I hope you’re right about Rivian, however, I am not holding my breath. How an organization is in business for 8 years without producing anything is beyond the scope of my knowledge. Hopefully, for Normal tax payers, I am wrong. Unfortunately, I think I’m right. It looks Rivian expanding quickly in the recent two years. Most EV companies are dying or on the way to die. Farady Future just sold their headquarter early March. Look at the price of Rivian pickup or FF91, they are just toy of rich people. And law makers are keeping adding help to electric vehicles. Where the money from? Of course middle class. This seraas must be someone has relation with Rivian. It is so obviously. Thanks to this research, I learned some true story of Rivian, the dark history they try to buried.